Many have come to expect MRI’s as the gold standard of care, especially in Western medicine when a swimmer has swimming shoulder pain. I recently spent a day shadowing a physical therapist well versed on the shoulder through his previous job as an athletic trainer in pro baseball. One new patient was a high school softball catcher with recent shoulder pain. Her mother was pushing her physician to order an MRI for a “definitive answer,” but he referred to the PT first. Why Get Physical Therapy When You Have Swimming Shoulder Pain? After his exam, the PT calmly told the mother that an MRI would be a waste of money. Uh-oh, watch out…how dare he suggest anything less than the best for her kid! Based on the vile stare she gave him, you’d have thought he called her kid ugly and fat! While the MRI is indeed the gold standard in certain aspects of practice, the correlation between repetitive use symptoms and abnormal imaging for the athletic shoulder is poor, as we’ll discuss below. Dr. Andrews is regarded as one of the most trustworthy opinions in sports medicine (especially when arguing against his own interest! ), but it’s worth a further look to see what others have found in the peer-reviewed literature with other athletic populations. Despite the poor relationship between imaging and present symptoms, some predict that abnormal scans may foretell future symptoms in presently asymptomatic athletes. That’s a very understandable concern, but does it have merit? Connor (2003) studied twenty elite overhead athletes, all asymptomatic. According to MRI’s, 40% of had partial or full thickness rotator cuff tears in their dominant shoulders. 20% had a Bennett’s lesion, which is a mineral buildup on the posterior glenoid fossa. Five years later, authors conducted follow up exams with the athletes. NONE of the athletes in the sample had subjective symptoms or required treatment during the five year period. Similarly, Fredericson (2009) studied a group of Division I college athletes in volleyball, swimming, and gymnastics. All athletes were asymptomatic and had normal physical examinations. 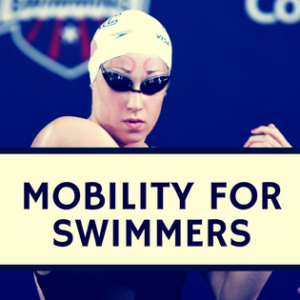 After MRI’s, five of the six swimmers exhibited “moderate” abnormalities of the labrum and four of six exhibited “moderate” abnormalities of shoulder ligaments. Abnormalities were classified as mild, moderate, or severe in the study. Similar to Conner above, this study included a follow up three to four years later. Only one athlete from each of the three populations had symptoms on the joints studied during this period. Athletes can have numerous abnormalities in one joint and still be asymptomatic.Jost (2005) studied thirty professional handball players and twenty control subjects. Throwing shoulders of the athletes averaged SEVEN abnormal findings per shoulder; more than both the non-throwing shoulder and the control group’s shoulders. 93% of throwing shoulders had abnormal findings, while only 37% of these were symptomatic. In other words, only one out of three shoulders in a sample averaging seven abnormalities per shoulder had symptoms. Authors concluded, “Symptoms correlated poorly with abnormalities seen on magnetic resonance imaging scans and findings from clinical tests. This suggests that the evaluation of an athlete’s throwing shoulder should be done very thoroughly and should not be based mainly on abnormalities seen on magnetic resonance imaging scans.” Also, consider that handball is a rough sport resembling water polo more than swimming, so we might expect a weaker relationship between symptoms and imaging in non-contact sports. 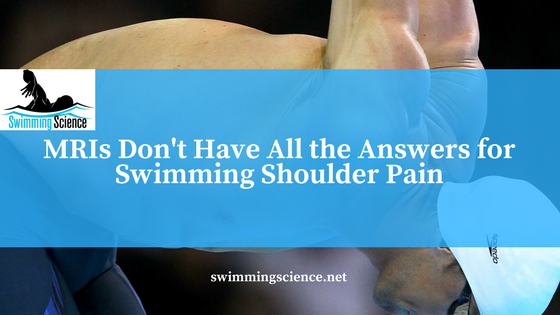 Even when swimming shoulder pain is present, it is not always tied to the site of the abnormality. Lajtai (2009) studied professional beach volleyball players and noted pain in the hitting shoulder in 63% of players. However, the pain was non-specific and “without clear correlations to the investigative clinical and imaging parameters,” which included MRI’s. Interestingly, 30% of the players demonstrated infraspinatus muscle atrophy and a loss of external rotation strength. 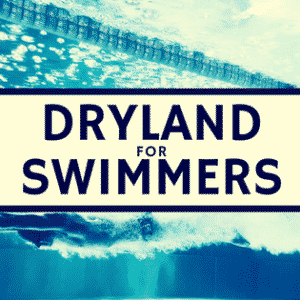 Although our primary focus is the shoulder, we should also recognize studies on the back and knees of swimmers which show the same poor correlation between imaging and symptoms. Kaneoka (2007) studied both elite swimmers and recreational swimmers and found that 68% of elites and 29% recreational exhibited lumbar disc degeneration but “there was no significant relationship observed among the variables of low back pain symptoms, swimming strokes, and disk degeneration.” Soder (2012) examined MRIs of elite adolescent swimmers (all asymptomatic) and found abnormalities in 69.2% of the knees studied; significantly higher than the control group of non-swimmers. There is no indication these swimmers were breaststroke specialists (see about knee MRIs in adolescent swimmers). Structural abnormalities seen on radiological images are common in active populations. We simply have an ability to take better pictures than in the past. If we looked at everyone’s skin through an electron microscope, the results would not be pretty either! Even when shoulder pain hits, the link between the abnormalities themselves and pain is inexact. One theory is that abnormalities may serve as beneficial adaptations for unnatural sporting movements requiring extreme ranges of motion in high volumes. Tearing may provide mobility, while scarring/lesions may be a stabilization strategy. This is only a theory, but it does explain, at least partially, why pictures only tell part of the story when it comes to pain. Before-and-after images may be most useful to detect different grades of damage in individual athletes over time, but most people don’t take MRI’s when things are going well. Finally, this information should not deter anyone from getting appropriate imaging and testing if there’s reason to believe the MRI will detect a more serious condition like a tumor. However, for repetitive use conditions, the image is only one piece of the puzzle. 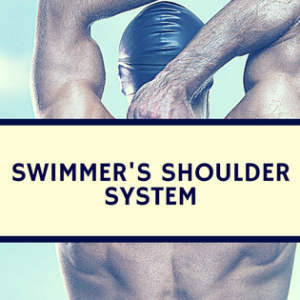 Also, make sure you have an individualized return to swimming program if you have shoulder pain! Soder RB, Mizerkowski MD, Petkowicz R, Baldisserotto M. MRI of the knee in asymptomatic adolescent swimmers: a controlled study. Br J Sports Med.2012 Mar;46(4):268-72. Epub 2011 Apr 3. Connor PM, Banks DM, Tyson AB, Coumas JS, D’Alessandro DF. Magnetic resonance imaging of the asymptomatic shoulder of overhead athletes: a 5-year follow-up study. Am J Sports Med. 2003 Sep-Oct;31(5):724-7. Jost B, Zumstein M, Pfirrmann CW, Zanetti M, Gerber C. MRI findings in throwing shoulders: abnormalities in professional handball players. Clin Orthop Relat Res. 2005 May;(434):130-7. Lajtai G, Pfirrmann CW, Aitzetmüller G, Pirkl C, Gerber C, Jost B. The shoulders of professional beach volleyball players: high prevalence of infraspinatus muscle atrophy. Am J Sports Med. 2009 Jul;37(7):1375-83. Epub 2009 Apr 9. Fredericson M, Ho C, Waite B, Jennings F, Peterson J, Williams C, Mathesonn GO. Magnetic resonance imaging abnormalities in the shoulder and wrist joints of asymptomatic elite athletes. PM R. 2009 Feb;1(2):107-16. Epub 2009 Feb 3. Kaneoka K, Shimizu K, Hangai M, Okuwaki T, Mamizuka N, Sakane M, Ochiai N. Lumbar intervertebral disk degeneration in elite competitive swimmers: a case control study. Am J Sports Med. 2007 Aug;35(8):1341-5. Epub 2007 Apr 3.